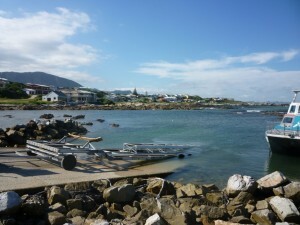 Arriving in the fishing port of Gansbaai, I was taken aback at by how beautiful the community was. The sea was lapping gently over the shore, with vast swathes of white sand beaches and lots of rockpools to explore. En route to the meeting point for my first trip out to sea on the shark boat, I stopped to watch the sun rise over the mountains, casting a red glow over the sand and onto the sea. It was pretty spectacular, and set me up well for the day to come. I was to be heading out on the shark watching boat to take part in the shark cage diving, and to see first hand what our volunteers are doing every day. 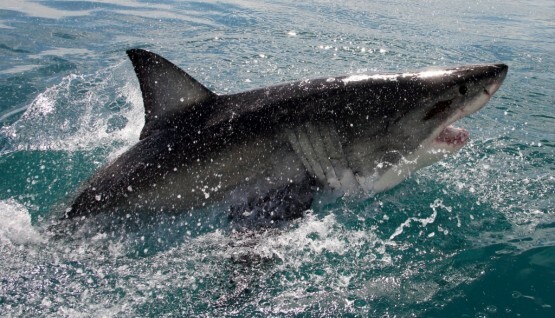 We received an excellent briefing first thing about sharks, safety and the general area. Volunteers often receive lectures and presentations about research and sharks, so they have an excellent knowledge base to be able to apply to the work out on the boats. We were set up with life jackets, sized up for the wetsuits and pointed in the direction of the boat. The volunteers were assisting with the whole process, setting us all up and also preparing the boat in readiness for the trip. this knowledge too. 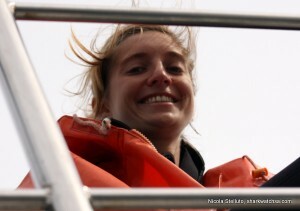 They also helped out with spotting the sharks, and identifying the ones that came to the boat. Amazingly, I think, each shark fin is like a human fingerprint- it is unique to that shark, so you can identify them easily with a bit of experience. Get involved with penguins too! happen! I had a great vantage point at the top deck of the boat, and to see the sharks swimming around in such clear water was amazing. They are extremely elegant, and move with such grace. Getting into the cage was fantastic too, as you could really see them up close and get an incredible insight into what these infamous creatures are really like. The sharks that we saw ranged from 2m to 4m. I learned so much about them, and left the trip feeling extremely satisfied- and wishing that I could do it again and again! 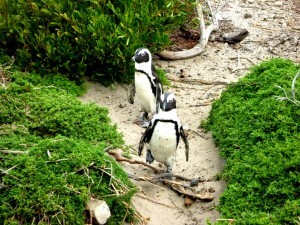 Instead I went to visit the penguin colony that we also work with in conjunction with the shark programme. Volunteers help to make houses for the penguins to nest in safely, guaranteeing a better survival rate of the infants. It was great to see so many houses built by volunteers, with many happy penguins starting to nest inside. I was very impressed by the great variety involved in this project, and sincerely wished that I could have stayed much longer!